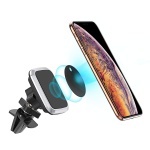 【Universal Fit】Matone Dashboard Car Phone Mount fits for all devices within 3-6.5inch: iPhone X/ 8 /8 Plus /7 /7 Plus /6s/ 6s Plus /6 /6 Plus/5Se/5s/5/4s, Samsung Galaxy S9 Plus/S9/S8 Plus/S8/Note 9/Note 8, HTC,LG, Nexus, Nokia, and other smartphones or GPS Devices. 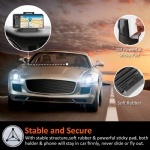 【Stable and Secure】The 3M brand powerful sticky pad enables the car phone holder to be firmly mounted on your car; with soft textured rubber mats inside the holder, your cellphone can be securely held by the holder with different viewing angles, without any scratch, even taking a sharp turn, sudden stop or accelerate. 【Compact Size】This car phone mount is in palm size, never block buttons of the cell phone, nor bring visual blind spots for drivers. Keep your phone close to your eye level and easy to reach by your hand, ensure you a safe and easy driving experience. Included with 5 sticky cable clips to organize the cable, keep your car tidy and neat. 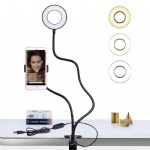 【Multiple Usage】It is not only a ideal phone holder for car, but also a great desk accessories in the office and house. Perfect angle of view when using Facetime and watching films. 【What You Will Get】1 Matone Dashboard Car Mount; 5 Cable Clips. 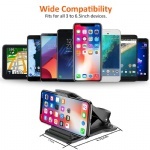 12 month Matone Warranty with Amazon 30 days Full Refund Guarantee; Lifetime customer support for Matone car phone holder. With 3M brand powerful sticky pad and soft textured rubber mats inside the holder, it can be mounted sturdy on your car and holds your device firmly, which is convenient for you to operate your smartphone while driving. Fits for all devices within 3-6.5inch: iPhone X/ 8 /8 Plus /7 /7 Plus /6s/ 6s Plus /6 /6 Plus/5Se/5s/5/4s, Samsung Galaxy S9 Plus/S9/S8 Plus/S8/Note 9/Note 8, HTC,LG, Nexus, Nokia, and other cellphones or GPS Devices. 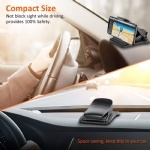 Pocket sized cell phone holder will never block your sight while driving, convenient and 100% safety. 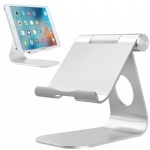 It can also be used as travel stand and hands-free phone cradle on desk or table top. 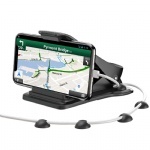 Matone Phone holder for Car include 12 month worry-free warranty and lifetime customer support.